The figure of Amenhotep II can be seen within the tomb, although the King's face has been destroyed (Amenhotep II is shown seated on his throne while Userhat makes offerings of fruits and garlands of flowers). The usual funerary feast scenes show friends and relantions of Userhat seated while waiters attend them - Userhat himself is shown sitting by a table filled with bread and other provisions. 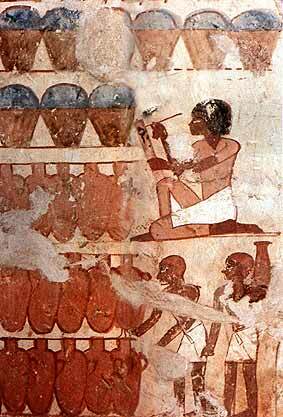 Other scenes here show the bakers seated next to their bread made in preparation for the feast. A close-up of the workers relaxing in Userhat's garden, some workers take the opportunity to have a hair-cut. Further scenes, this time on the left side of the entrance to the tomb, show Userhat, his wife and their daughter standing before offerings (the figures of the wife and daughter have been erased - this was due to a early christian monk who lived in the tomb). There are some agricultural scenes, cows amongst some trees and the measurement of grain. "For the sake of your soul, make a happy day in your beautiful house of eternity which is your dwelling for ever. You are seated in it, your heart being happy, while you follow this good god Osiris, Lord of Eternity, who grants that you shall receive food in his presence at all times of the day". 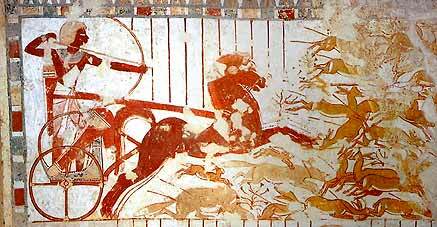 The inner chamber of the tomb depicts Userhat hunting in his chariot. He shoots arrows at various gazelles, hyenas, jackals and hares. 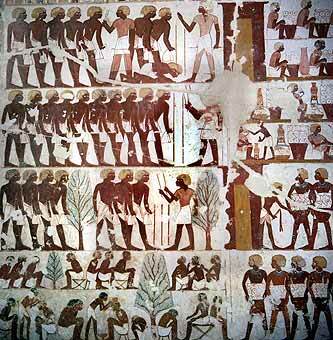 Other hunting scenes in this room show him hunting in the marshes with snares and boomerangs. 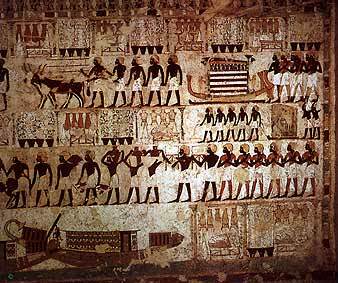 Finally there are scenes of Userhat's funeral - the coffin being carried to the tomb in the funeral procession, the journey across the Nile in boats, and the carrying of the funerary equipment to the tomb. The tomb orignally held seated statues of Userhat and his wife - but now only the feet of one of the statues still remains.